This page will provide you with information about having a hip replacement. For further details, please speak to your consultant. The term arthritis covers a range of conditions which cause damage to joints. Osteoarthritis is the most common form of this condition, defined by long-term deterioration of a joint. Other conditions in this group cause joint inflammation. The outcome of arthritis can be the disintegration of the covering of the cartilage, leaving the joint beneath open to damage. Pain and stiffness of the joint is the inevitable result. Successful hip replacement surgery will result in reduced pain and increased mobility. Painkillers and anti-inflammatories such as paracetamol and ibuprofen respectively, can keep pain under control. You may find relief using dietary supplements, although you should always check with your health care professional before taking these. Physical aids such as a walking stick, ‘shoe-raising’ or ‘build-up’ may help with mobility. Stiffness can be helped by taking regular exercise in moderation. Additionally, a steroid injection can also help with stiffness and pain. It is applied to the joint in the hip. However as the arthritis worsens, these treatments become less effective. An alternative to total hip replacement (THR) is hip resurfacing. This is a more conservative procedure which replaces the diseased or damaged surface to the bones. Your consultant may recommend this as an alternative, depending on your age, lifestyle and the health of your bones. A number of anaesthetic options are available. The surgeon will make an incision on the side of your hip to access the ball and socket which is damaged. 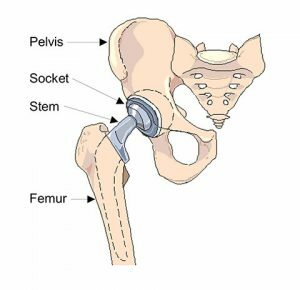 The artificial hip implant may either be a metal stem and metal acetabular cup with ceramic on ceramic bearing, or a metal stem and metal acetabular cup with polyethylene (hard plastic) lining. The new artificial hip may or may not be secured with acrylic cement depending on age, bone quality and consultant preference. Using acrylic cement or alternative special coatings the new ball and socket will be bonded directly to the bone. On average, the procedure takes one hour to one and half hours. An average of three to seven days is spent in hospital after this operation. You will need to use support aids to walk for a short while. The best way to ensure good recovery is to maintain a pattern of exercise on a regular basis, although you should obtain advice from your GP before embarking on any exercise. The best outcome experienced by most is reduced pain and better mobility. An artificial hip needs good long-term care to limit wear and tear. Otherwise, just like a natural hip joint, it will not last forever. Suffering from arthritis of the hip can be due to injury or rheumatoid arthritis, but often there is no known reason. If you are experiencing severe pain, difficulty with mobility and stiffness, a hip replacement could help lessen the pain and make walking easier. Price for this procedure from £12800. Enquire about our self-pay options by clicking here.